Jo Boden’s young life was torn apart when her older sister Sarah was murdered at university. Seventeen years later, Jo is now a high-flying detective with the Met in London and has learned that Sarah’s killer is shortly to be released on licence. And when moves are set in motion to try to clear the man’s name, Jo is forced revisit some dark secrets of her own. Susan Wilkins’ background is in TV scriptwriting – she has worked on shows ranging from Casualty and Heartbeat to Coronation Street and EastEnders – and this highly observant author brings her eye for visual drama and diamond-sharp characterisation to her enthralling crime novels. After the dark and gritty Kaz Phelps trilogy, which comprised The Informant , The Mourner and The Killer, It Should Have Been Me is a tense, taut, psychological thriller which grips like a vice from the brutal opener right through to an explosive showdown. DC Jo Boden was only eleven when her older sister, Sarah – always regarded as her parents’ golden child – was brutally murdered during her first year at university. Her boyfriend, Nathan Wade, a fellow student, was convicted of the killing. But Wade, a model prisoner, is now being freed from jail and documentary film-maker, Briony Rowe, who was at university with both Sarah and Wade, says she can prove his innocence, and is ready to make a film about his wrongful conviction. The Boden family has never recovered from the tragedy. Jo spent her teenage years in therapy, her parents split up and her mother is now constantly needy and insecure. But they have always been certain of one thing… that Wade was guilty. Jo, who grew up believing her intelligent, beautiful sister was perfect in every way, starts to question the evidence which put Wade behind bars. 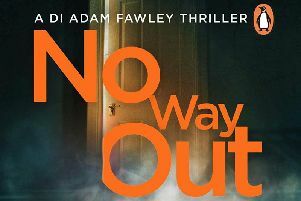 But Wade has violent tendencies that he has kept well hidden in prison, Briony Rowe may not be entirely honest in her dealings, and Jo is harbouring her own secrets. Soon Jo is questioning everything she ever believed in… and danger is only a heartbeat away. Wilkins delivers another full-throttle, top-notch thriller full of grit, insight, emotion, action and edge-of-the seat tension. At its heart is the fiery Jo, a strong, confident and fearless woman with a hard shell forged by tragedy, and not afraid to rush in where her weaker colleagues fear to tread. But her sister’s murder has left a scar on her psyche and the opening of old wounds renders this tough cookie uncharacteristically vulnerable and open to making potentially disastrous decisions. Layered with the mystery of Sarah’s murder is Jo’s part in a perilous undercover operation to trap and convict a ruthless gang of Albanian human traffickers whose activities put the lives of not just their victims but also the investigating police officers in serious jeopardy. Gripping and gritty, this is Wilkins at her thriller writing best.